In addition to the normal backlight, Suunto Kailash has an extra bright backlight that you can use as a flashlight. 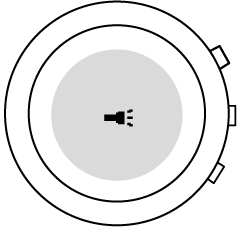 To activate the flashlight, keep the lower button pressed a few seconds until the brightness increases and the flashlight icon appears. The flashlight stays on for about 4 minutes. To turn it off, press the lower button again.